Mondays 10 - 4; Tuesdays 1 - 8; Thursdays 5 - 8; Saturdays 10 - 12:30 (except summer). Our library is a vital source of information and entertainment. Aside from books, CDs, DVDs and videos, there are infra-red and Go-Pro cameras to borrow, toys in the Children's Section, a telescope, free faxing and copies at $0.10 each! The library subscribes to close to 20 different magazines and journals. There's free high speed wi-fi for your own laptop, or use one of the three library computers (two are new!). Through inter-library loans you can get any book, CD or DVD from another library. You can find out if the book, CD, DVD or video you are looking for is in the Warwick Library or any other Central or Western Massachusetts library by clicking here: search the Warwick library's collection or any other CWMars library - or search them all. Order books on-line through CWMARS and have them delivered to Warwick. A visitor from Worcester recently returned an old copy of The Door by Mary Rhinehart. Its age drew my attention, which led the traveler to remark that he'd wanted to take a drive, and he told me and another Warwickian that he'd become curious about Rhinehart after her name appeared as a Jeopardy! clue in connection with the phrase "The butler did it." He said she was the American equivalent of Agatha Christie - before Agatha Christie. The Warwickian, being a mystery fan, decided to take it out on the spot. And, as she was leaving, another patron walked in to return Christie's Easy to Kill. Cycle complete! Ongoing work on the Historical Collection has uncovered, among other treasures, a clean 1937 edition of Audubon's "The Birds of America". This classic, full of color plates of his original drawings, is now on display - take a look! A generous donor has gifted the Library with a copy of Lost Words, an artistic rendering of 20 common nature words among the 40 dropped from a recent edition of the Oxford Junior Dictionary. The lost words include such familiars as acorn, dandelion, fern, heron and newt. Their replacements include such more modern familiars as blog, broadband, bullet-point and voicemail. This self-described "spell-book" has, the publishers, say, "begun a grassroots movement to re-wild childhood across Britain, Europe and North America". A striking book of colorized historical photographs called The Paper Time Machine was on display when I began, and the time came to switch it out with one of the many other impressive large format art-related documentary volumes from the shelf below. Before putting this one to bed I opened it at random (of course) to a photo c. 1912 titled "A young woman uses a hand-cranked battery charger to power her electric Columbia Mark 68 Victoria automobile." The accompanying text notes: "At the beginning of the 1910s, around 38 percent of all cars in America were electric." I decided to take it home and found it needed to be catalogued. When I tried to catalog it I learned it was the only copy of the book in all of Central and Western Mass! And on the following page - a photo of the massive iceberg thought to have sunk The Titanic. Book donations: Please check with me before you donate books to the Library. Don't leave them in the book drop. We do not take old text books, magazines or other library discards. Hospitals or nursing homes are better bets when looking for homes for books - most people are looking for brand new books at the Library. DVD and music CD collections: If you have any suggestions for the DVD film collection or the Wallace Music collection, please let me know. And, if you'd like to donate any old films or CDs that are in excellent condition, please check with me before you drop any items off. DVD courses: Major Transitions in Evolution, Understanding the Universe: An Introduction to Astronomy, The Nature of Earth: An Introduction to Geology and Understanding the World's Greatest Structures. Each course has DVDs, course book and transcripts of the lectures. Electronic resources: To access OverDrive's extensive collection of ebooks and audio books via C/W MARS, simply visit https://cwmars.overdrive.com/ and login with your C/W MARS library card. Contact me at the Library if you have questions about Overdrive, or are interested in using it. All you need to get started is a library card - or at least your account # (on file). To access the statewide database of millions of full text articles from magazines and newspapers, visit https://www.galepages.com/mlin_w_warwick. There are great resources for school research and for hobbies and leisure. No login should be required as long as you are in Massachusetts. Heat loss camera: The Library's infrared camera can show you where you are losing heat in your home. It's easy to use and you may check it out for a week at a time. Items to borrow: Infra-red camera, museum & State Park passes, Go Pro camera, telescope, ukuleles, Watt Meter - and books, too! Library cards: If you don't have a CWMARS card from the Warwick Library or another library in our region, stop in and fill out an application. A CWMARS card or account is needed to check out items at the Library. If you already have a card at one of the other CWMARS libraries, these will work as well. Museum & Park passes available: Eric Carle Museum, Clark Museum, Magic Wings, MA State Parks, Mass MOCA, Springfield Museums (until April 2019 only) with Dr. Seuss museum and gardens, Tower Hill Botanic Gardens and Worcester Art Museum. Program/Workshop ideas wanted: What types of programs would you like to see at the Library? For adults? For young people? Let's get creative, have some fun, and maybe even learn something! Puzzles: Thanks to generous donations from town newsletter readers, a collection of puzzles of various size and complexity is available for borrowing. Reading group: Meets the second Wednesday of each month to discuss a book read by all. Books are provided by the Library and a facilitator helps move the discussion along. Saturday socials: The Library serves coffee and snacks during Saturday morning open hours from 10 am to 12:30 pm. We have purchased a single serve coffee maker so that you may enjoy a hot cup of regular or decaf at any time - not just Saturday. Hot water for tea is also available. Come relax and schmooze with your neighbors, get trash bags and/or grab a book or movie! Trail maps: New England Trail Maps and Guides for 10 hikes each in Massachusetts and Connecticut. Stop by and borrow this waterproof map and take a hike! Trash bags for the Transfer Station: $3.00 for 33 gal. size or $1.50 for 13 gal size. 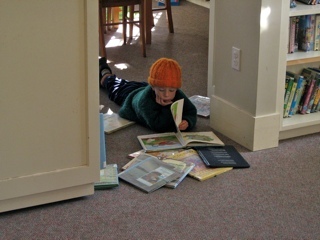 Young Reviewers Initiative from Tanglewood Press: All Tanglewood books are vetted by young readers to ensure authenticity of voice and a fun read. Now, they are looking to expand and make it more official. If you are parents with kids (8-12) and teens (13-18) you think might be interested in the initiative, please contact me at the Library and I'll forward the follow-up information. April is National Poetry Month! 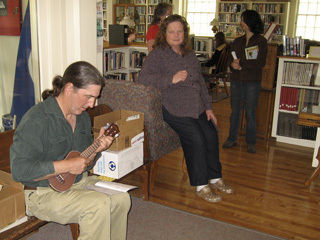 Come to the Library on Sunday, April 14th from 3 - 4:30 p.m. for a Poetry Celebration and Open Mic: open to all town residents to attend, listen - and, if you want, read poetry (yours and/or somebody else's) in 5-minute slots. Light refreshments will be served. April 20 (Sat): Indian Caves Hike (Hermit book-related event) - carpool from the Library at 1:30 p.m. Note: Rain cancels and event is rescheduled for April 28. If no rain, event is on. April also kicks off the Warwick Library's Spring Local Author Series. Hazel Dawkins is first up on Monday, April 29th at 6:30 pm. Hazel is the author of several Dr. Yoko mystery novels, the stimulus for which comes from her factual books about the speciality of neuro-optometry. The most recent Dr. Yoko mystery is Eyes on the Past. 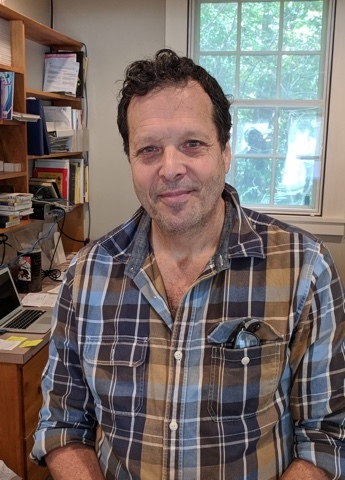 An editor-writer who has worked in London, Paris and New York, Dawkins now lives in self-described "bucolic" western Massachusetts. 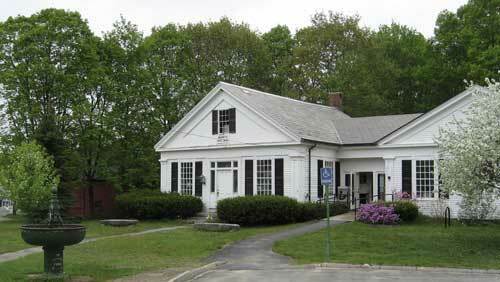 Athol-based author J.D. McKintosh will present at the Library on Wednesday, May 15th at 7 pm. Her recently-released book is titled Niagara Fontaine, a Meredith, Massachusetts novel. And on Monday, June 3rd at 7 pm, the Library will feature Michael Ponsor, whose 2017 novel The One-Eyed Judge is the second in the Judge Norcross legal thriller series. Judge Ponsor serves on the U.S. District Court in Springfield, MA. A (Visual) History of the American Public Library: A stunning exploration of how a critical piece of social infrastructure came to be, from Citylab (citylab.com). A recent episode of This American Life focuses on ways that public libraries meet very specific needs. Libraries are compared to the Room of Requirement from the Harry Potter series. For you non-Potters out there, the room magically becomes exactly what a young wizard needs when they want it. You can hear the full episode here. Also worth a listen is the "The Librarian is LIVE" episode of The Librarian is In! It's another great discussion on the inherent value of libraries and the social capital they provide for communities. The Last Coyote, by Michael Connelly, by Fern Michaels - Free Fall, Hide and Seek, Hokus Pokus. On the Shoulders of Giants: My Journey Through the Harlem Renaissance, by Kareem Abdul Jabbar; The Simple Guide to a Minimalist Life, by Leo Babauta; Escaping the Prison of the Intellect: A Journey from Here to Here, by Deepak Chopra; Don't Know Much About Mythology: Everything You Need to Know About the Greatest Stories in Human History But Never Learned, by Kenneth Davis; Way Off the Road: Discovering the Peculiar Charms of Small-town America, by William Geist; How Starbucks Saved My Life: A Son of Privilege Learns to Live Like Everyone Else, by Michael Gill; The Last Stand: Custer, Sitting Bull, and the Battle of the Little Bighorn, by Nathaniel Philbrick; How Full is Your Bucket? Positive Strategies for Work and Life, by Tom Rath; A History of the World in 6 Glasses, by Tom Standage. American Beauty, Derek, Finding Fela!, Grace & Frankie - Season One, MASH - Seasons 1-11, The Monarch of the Glen - Seasons 1-7, Rumble: The Indians who Rocked the World, Unbreakable Kimmy Schmidt - Season 1.